Originally released way back in 1970, the unique sound of the Minimoog analog synthesizer means the hardware is still in demand today. 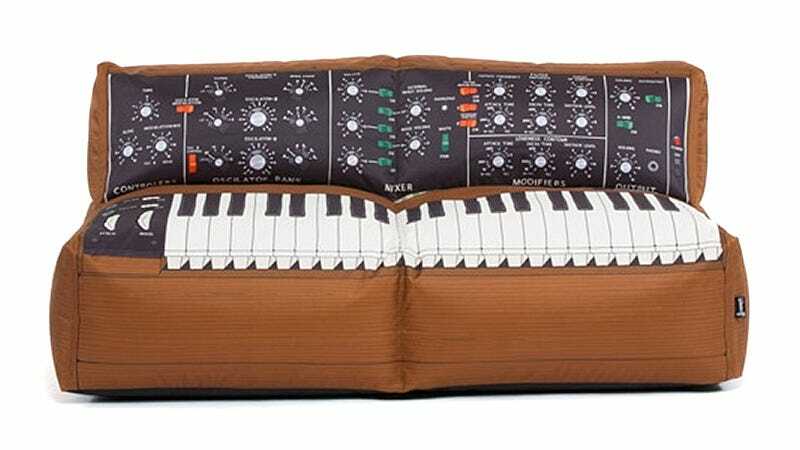 But since Moog stopped producing the synths back in 1981, they’re incredibly rare and expensive now—unless you’re happy to add this sofa equivalent to your studio. The sofa’s outer shell is made from washing machine-safe canvas that’s been printed with an oversized Minimoog design using eco-friendly inks. It’s filled with polystyrene beads, which means that without a frame it probably feels more like plunking down on a bean bag chair instead of a sofa—but that’s still a great place to take a nap. Pricing is around $420 so it’s definitely more expensive than a nondescript bean bag chair. But since original Minimoogs synths sell for around $10,000 on eBay, this is a much cheaper solution. If you still want to make music with it, just go download Moog’s new $30 synthesizer app and curl up with your smartphone.